I slept all day today. Well, OK only until 11:30 but still. It was actually really hilarious because my alarm was chirping birds and was set for noon. Then when I woke up I just didn’t turn it off and at the exact moment I opened up my window this morning, the alarm went off. I thought there were just an uncanny amount of birds in our courtyard today, but alas, I was wrong. We went to a museum that had miniatures and movie things in it. It was kind of crazy actually. There were eight (huit) floors of stuff and one would have a bunch of old movie props and the next would have miniature scale rooms and things. One floor has stuff like scaled down furniture, clothing and shoes (among other things). Then we got more ice cream. Of course. 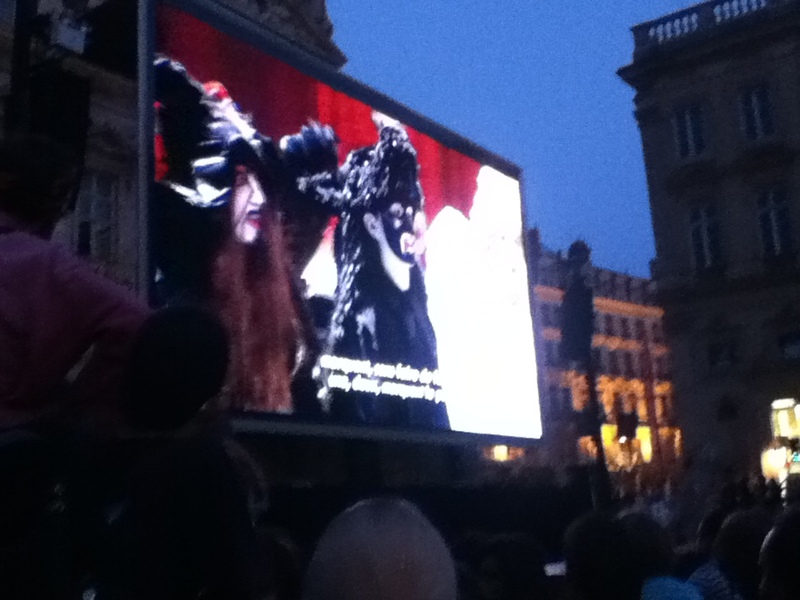 We sat outside in this huge public square called the Place des Terraux and drank our beer and watched Carmen. It would have been really good if I wasn’t sitting on the concrete ground. So we basically left after the first act. But I understood a surprising amount of the production! After that, instead of going out, I Skyped with my big and watched some episodes of Girls. Very eventful Saturday evening.